Can You Trust Hunter Henry as Your Starting TE? 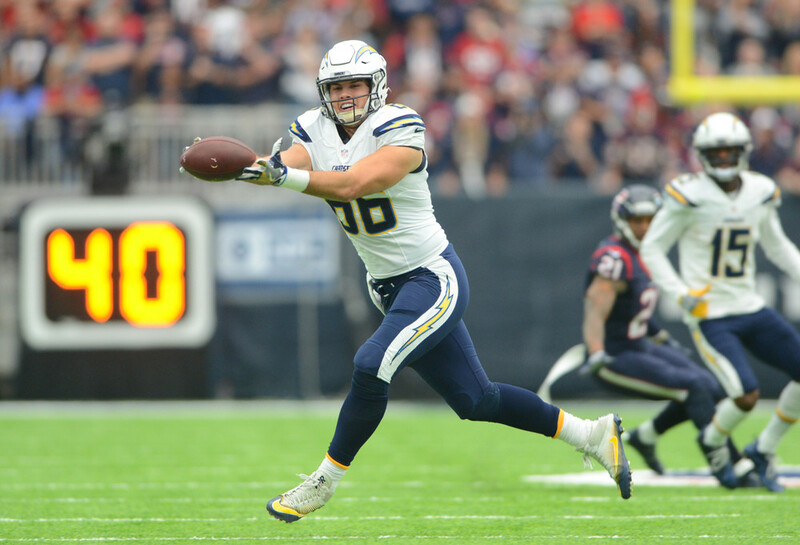 This past season, Los Angeles Chargers’ rookie tight end Hunter Henry finished with 36 receptions for 478 yards and an impressive 8 touchdowns. Although Henry didn’t receive many targets (53) in the 15 games he played in, this put him in rare company -- since 2010, only four players at the position have recorded at least 400 yards and 5 touchdowns in their rookie season. Henry ended the year as the 11th tight end in standard-scoring leagues, and was ranked considerably lower at 18th in PPR scoring due to his lack of target share in the offense. 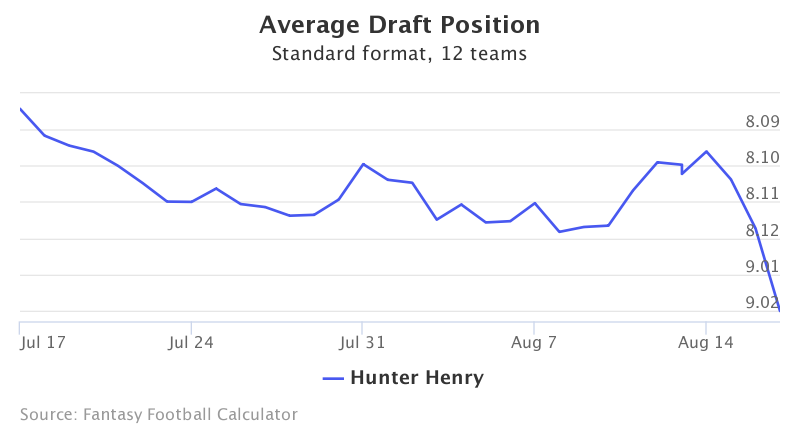 Henry’s fantasy football ADP has been gradually falling over the past month, and is currently being selected as the 11th pick of the 8th round, and 94th selection overall. Data is from 12-team standard mock drafts. Henry’s 478 yards ranked him 23rd out of all tight ends last year, while his 8 touchdowns was tied with Cameron Brate for the league high at the position. Henry’s fantasy production last year was very touchdown dependant, as he only averaged 31.87 yards per game. This in large part was due to sharing the field with future Hall of Famer Antonio Gates, who himself caught 53 balls for 583 yards and 7 touchdowns. Fast forward to this year -- with Philip Rivers’ favorite wide receiver returning in Keenan Allen and Gates only needing 1 touchdown to set the all time receiving touchdown record for tight ends, Henry may find it difficult to significantly increase his market share in the offense this year. With rookie wide receiver Mike Williams on the PUP list to begin training camp (with the possibility of needing surgery), this surely helps Henry’s case if he has to miss time. There are, however, many other receiving options in the Chargers’ offense that will demand their fair share of targets: Tyrell Williams, Travis Benjamin, and Dontrelle Inman. Chasing touchdowns from the previous season can be dangerous, and with Henry splitting time, Kyle Rudolph offers value being selected a half round later, as are off-season “sleepers” Jack Doyle and Eric Ebron who are being drafted at 12.02 and 12.06, respectively. However, if Antonio Gates is either injured or takes a backseat role once he sets the tight end TD record, Henry’s upside is a top 5 at the position. Check out the Average Draft Position page for more information about where players are going and take part in a Mock Draft to prepare for the 2017 season.